I was pleasantly surprised to find more than 500 views for my last post, thanks to Kimbra’s Facebook page. Thank you! You basically made up for my entire blog’s traffic within a single day! It inspired me a little to get back on the blogging bandwagon, so here’s today’s Meatless Monday post. 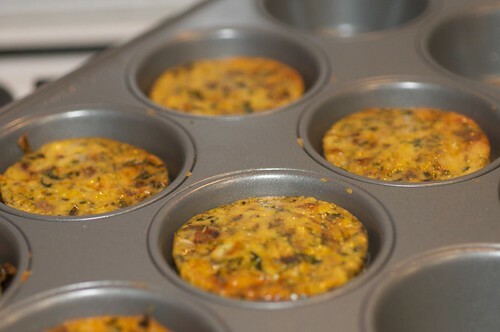 I’m a huge fan of frittata because they’re just so easy to make. It’s basically an excuse to throw left overs in the fridge and turn it into a meal. With this recipe I was looking for something small enough to pack for a hike, but still be quite filling. Adjust oven heat to 110 degrees celcius. Place tray in the oven and bake for 20 minutes. Can be served both hot or at room temperature. 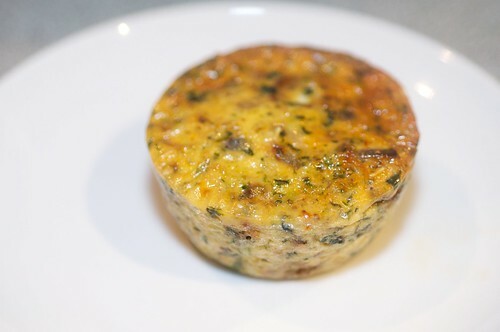 Frittatas make for excellent picnic food – eaten hot or cold – or for a nice brunch with some salad.